Half Brick delivers a super-fun side scrolling adventure with Jetpack Joyride. 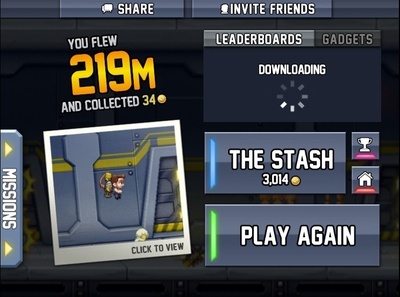 I first downloaded Jetpack Joyride for my Blackberry Playbook. It was one of the first apps I downloaded onto the tablet, and is still one of the best free games offered in the Appworld store that I have played. I have since downloaded the game on my iPhone and installed the Facebook App. One of the amazing things about Jetpack Joyride is that Half Brick released the game on so many different platforms. No matter what device you are using, you can probably pick up a copy. Jetpack Joyride went on to win multiple awards, including Gamasutra Mobile Game of 2011 and UGO iOS Game of the Year. 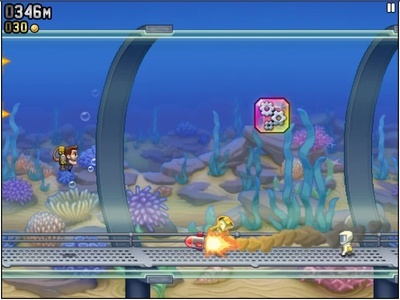 In Jetpack Joyride, players control Barry Steakfries as he flies around on his jetpack, avoiding missiles, zappers and lasers. The goal of the game is to make it as far as you can without dying. The game is quick to learn and easy to get into, but hard to master. It runs smooth on both the Blackberry Playbook and iPhone but lags often when played on Facebook. Despite the fact that I loved being able to post on my wall about Jetpack Joyride, the lag was too much to handle. I have to assume that Half Brick had a retro, SNES kind of feel in mind when they were designing Jetpack Joyride. The graphics and music have such a nostalgic feeling to them that I can’t help but think of games I grew up with like Super Mario World and Act Raiser. The art style is fun, with hidden jokes like the “do not steal” sign at the beginning of the game and the “Barry” coin configuration, that keeps player chuckling as they play. The song is also very addictive. I’ve been known to walk around humming it while I shop or drive. 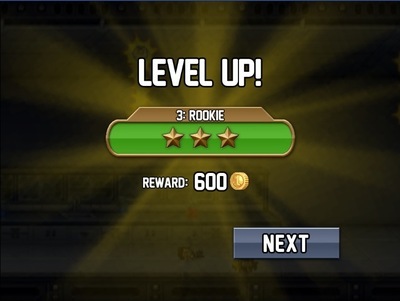 The basic gameplay in Jetpack Joyride may start to feel a little repetitive after a while but Half Brick added a lot of extras to keep players engaged. As you play, you will gather coins that are used to buy things via “The Stash”. You can customize Barry’s wardrobe and buy him new jetpacks, as well as upgrade the neat vehicles Barry can pick up along his jetpack travels. Players can also buy bonus items to be used in game, as well as check out all kinds of personal stats and achievements – omg, I’ve spent almost 12 days in game. Players can also get a leg up by buying additional coins for as little as 99 cents in the “Get Coins” area of The Stash. Another great way to earn coins is to complete the game’s Missions. Players get three missions at a time. Each mission is worth a predetermined amount of stars, between one and three, depending on the mission’s difficulty level. The stars are used to allow players to level up and get coin bonuses. One of the best parts of Jetpack Joyride is choosing different combinations of utilities and gadgets before starting a game and then riding in the unique vehicles while in game. The game has small variety if one-time use bonuses called “Utilities” which add a lot to your game, like giving you a head start or bringing Barry back to life. Gadgets are more plentiful and useful. Players can have up to two Gadgets equipped at a time. There are twelve Gadgets in total, and players can unlock them three at a time. Some missions also require that certain Gadgets be equipped. Each Gadget is different, and will help a player in a different way. Some will help a player gather coins while others may help the player make it further in the game or travel a little farther once the player dies. With so many fun aspects and different ways to play, Jetpack Joyride is a fun, fast-paced game for all ages. What Kind of Games does your Family Play Together?